No update on King Tut - I didn't stitch on him at all this weekend. Instead I picked up my knitting needles and started on a fresh pair of socks. I'm using this pattern here. The wool I'm using is Opal Hundertwasser Seeschlange. One sock is done - after ripping is up (twice!!!) as I wasn't happy with the cuff and also not too happy how the pattern came out. So I switched to a standard knit 1 purl 1 for the cuff and also use a 7 repeat instead of an 8 repeat for the pattern. You can't see the pattern very well in the picture, though you might get an idea. I should have both socks by next weekend. Yeah, Heroes has a new episode. The more I see of that show, the more I like it. Very well acted and written. New Atlantis episode, too. I loved how McKay mangled the name of that one scientist. Sheppard: 9 mil, this way. McKay: Oh yes, let's race towards the gunfire. *sigh* only two more to go, until the long time without new episodes. 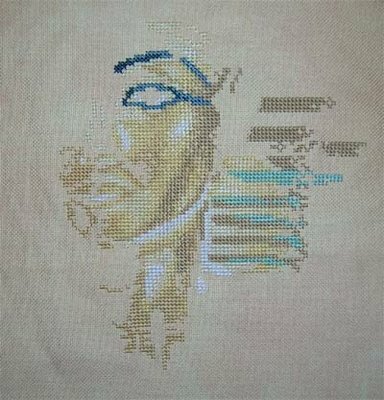 Got quite a bit of progress on King Tut. It is an easy stitch (at least so far), but luckily not a boring one. I've also got some progress on 'Not Forgotten' as well. The right dragon is almost done. 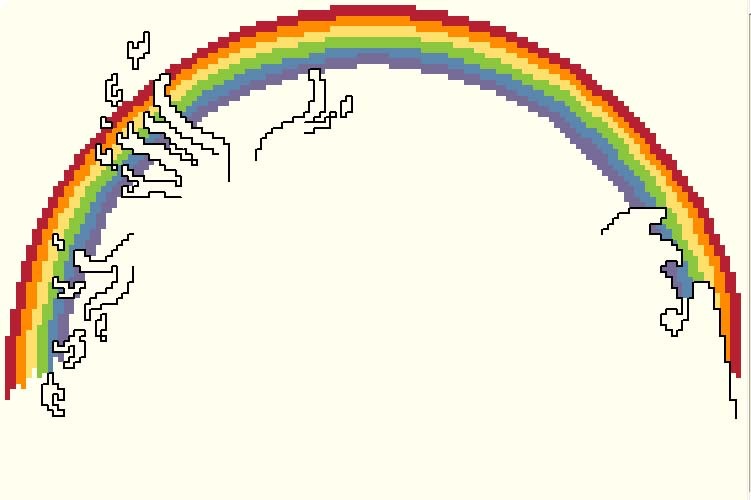 What do you think, should I go with this rainbow, or should I go for the original one? Now Ii'm waiting for the fanfic to come pouring in. 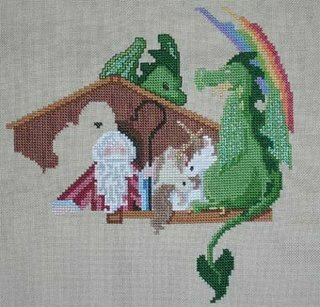 Finally finished with 'Eragorn'. I thought it was sort of okayish, and I'm going to go on witht he series, but I will read something else in between. No idea what, though. 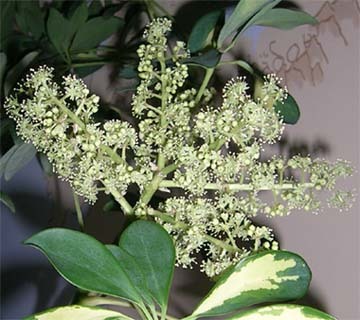 I don't know if it's the mild weather, or something else, but I didn't even know that a schefflera could bloom. But mine is. I've 'rescued' the plant from a broken off plant part from my office several years ago and it never did bloom before. The blossoms are tiny, and as far as I can tell, don't smell of anything. But it's somehow cute. I wonder if I get seeds ... well maybe not. Update on King Tut. Got quite a bit of him done. 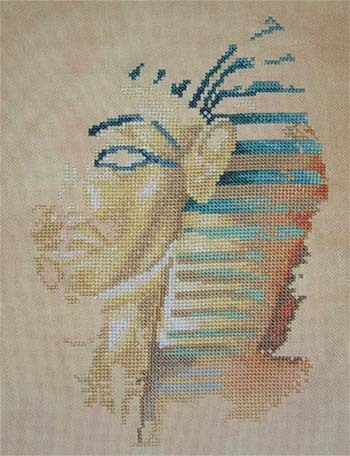 He's a fairly easy stitch - no fractionals, no special stitches, no blends. I have to see how long it's going to take before I'm bored out of my mind. 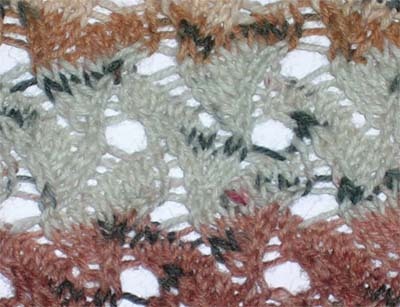 The pattern is 205 x 244 stitches (though not every single field is stitched, a good part is). I also liked how they made the 'bad' guy's motiation understandable (at least the second guy's ... the first one, well, this is never a solution for me) - as Teyla said in the end, John would have done the same. Sheppard: Look if this rock burns up in the atmoshpere I'll fight you to the death myself. Deal. It really has been fun to stitch, interesting to try many different technics. I also remembered why I didn't like stitching with beads. I did use the recommened fabric and color, but instead of a 28ct I used an 32ct (the shop I bought the fabric from didn't have enough of the 28ct, and as I don't come as often to the US as I like, I took what they had). For most of the pattern it didn't really matter, except maybe for the beads, which look a little crowded. 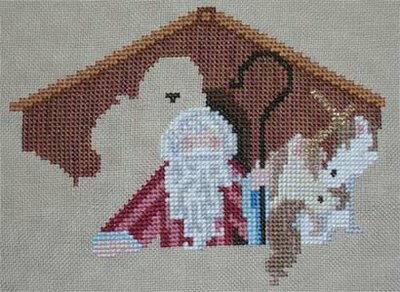 I've also got the embellishment package, which was plenty of most of the fibers, except the Wisper W88 white - I didn't have enough in the package to finish the last white dog. Luckily I've already got some of the Wisper for 'Not Forgotten', so it wasn't a real problems. Now to find a good frame and a place to hang it up. I've bought the kit about a year ago for half price in London (else it would have been too expensive). For a change, I already know where I'm going to hang it once it's finished. I've checked the theads and found that one color is missing (the card has a tear in the place it should have been). I've wrote to Lanarte - have to see what their reaction is. A happy new year to everybody. Last days of the years I've snuck in a smallish Dragon Dream Pattern: Lost Dragon Sampler. Cute and fun to do, too. My excuse is that I needed to find out how much of the specialty threads is needed, as I plan on kitting it up for a present for somebody I'm not going to name here (and for the records: less than a meter of each is plenty). I've altered the 'it' in the lower text to 'him', switched two band colors (by accident, really, not that anybody would notice) and changed the color of the word 'Lost' to Distant Hills from Budding Leaves. Also, for my travel project, I've started with 'Not Forgotton' also from Dragon Dreams. My at home project (Northern Lights Sampler) is pretty far now, maybe five or six bands left to do. 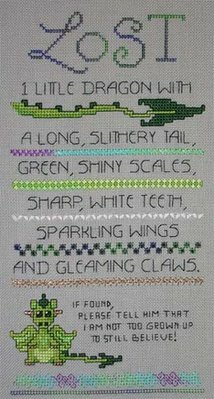 I'm sort of undecided if I start on a Teresa Wentzler next (either Castle Sampler or The Fortunate Traveler) or start on a large kit I've got in England last year. I've discovered the series 'Heroes' and love it. I can't wait to see how it will go on. I've finished posting my Thunderbird Story. Not many reviews *sigh* But it seems that it's not really a good season for reviews. I'm not the only one who noticed that there were little. Of course, that draws a little bit the fun out of writting. And it doesn't help that I looked at the stuff I've wrote for 'Where the Stars are Quite' (the next TB story I'm working on) and decided to trash the last two chapters.